She is survived by her husband, ex-US President George Herbert Walker Bush, five children -- including former President George W. Bush -- 17 grandchildren and seven great-grandchildren. Former First Lady Barbara Pierce Bush, wife of a United States president and mother of another, died Tuesday. Her husband George Herbert Walker Bush, the former US president and her son George Walker Bush, also a former president, were by her side along with other family members when she breathed her last at her Houston home. "A former First Lady of the United States of America and relentless proponent of family literacy, Barbara Pierce Bush passed away Tuesday, April 17, 2018 at the age of 92," said a statement from the office of her husband. Funeral arrangements would be announced as soon as is practical, the statement said. She is survived by her husband, five children -- including former President George W. Bush -- and her brother Scott Pierce, as well as 17 grandchildren and seven great-grandchildren. Joining the nation in celebrating the life of Barbara Bush, US President Donald Trump and First Lady Melania said Barbara Bush as a wife, mother, grandmother, military spouse, and former First Lady, was an advocate of the American family. "Amongst her greatest achievements was recognising the importance of literacy as a fundamental family value that requires nurturing and protection. She will be long remembered for her strong devotion to country and family, both of which she served unfailingly well," Trump said. In another statement issued by his campaign, Trump said the former First Lady will always be remembered for bringing strength and dignity to the White House, the Presidency, and America. "Because of Mrs. Bush's dynamic personality and devotion to her family, she will serve as an inspiration for future generations of Americans to come," Trump said. "Barbara Bush always approached her responsibilities with great integrity, and will also be remembered for her humility and understanding of the challenges of everyday Americans," he said. Melania Trump also expressed condolences at Barbara Bush's demise. "Throughout her life, she put family and country above all else. Her dedicated service to the American people was matched only by her compassion and love of family," Melania Trump said. "She was a woman of strength and we will always remember her for her most important roles of wife, mother, and First Lady of the United States. My heartfelt condolences and prayers are with the Bush family as we honour her legacy," she said. Barbara Bush, the New York native and longtime Texas resident served as America's first lady beginning 1989 -- when her husband was elected as the President of the United States -- till 1993. Later, her son George W. Bush was also president of the US, serving from 2001 until 2009. Her son Jeb Bush was the 43rd governor of Florida, and also a 2016 Republican presidential candidate. Born in 1925, Bush spent her childhood in Rye, New York, before moving to South Carolina to attend the prestigious Charleston boarding school Ashley Hall, according to the White House. 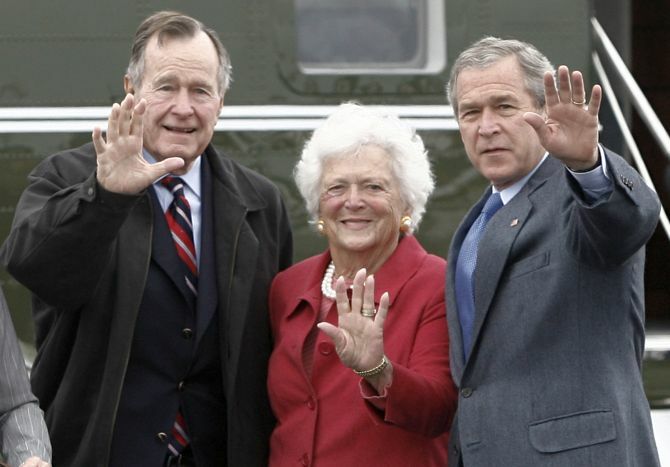 Known for her wit and fortitude, Bush spent her final years with her husband in their homes Houston, Texas, and Kennebunkport, Maine. When asked if she planned to follow her skydiving husband's lead and take a leap on her milestone 90th birthday in 2015, the former First Lady told media, "I'm too smart to jump out of a perfectly good plane. I am not jumping out of an airplane. I am not an idiot." She also wrote multiple children's books and published a memoir -- Barbara Bush: A Memoir and Reflections: Life After the White House -- in 2003. In 1992 she also authored Millie's Book, written from the perspective of the first dog. Son and former President George W Bush released a statement saying his "dear mother" had passed away and that the family would "miss her dearly". "My dear mother has passed on at age 92. Laura, Barbara, Jenna, and I are sad, but our souls are settled because we know hers was," the statement said. "Barbara Bush was a fabulous First Lady and a woman unlike any other who brought levity, love, and literacy to millions. To us, she was so much more. Former President Bush said that his mother "kept us on our toes and kept us laughing until the end". Former Florida Governor Jeb Bush in a statement said that he was "exceptionally privileged" to be her son. Former US President Barack Obama and First Lady Michelle said that she was the rock of a family dedicated to public service. "We'll always be grateful to Mrs. Bush for the generosity she showed to us throughout our time in the White House, but were even more grateful for the way she lived her life – as a testament to the fact that public service is an important and noble calling; as an example of the humility and decency that reflects the very best of the American spirit,"Obama said. House Speaker Paul Ryan said Barbara Bush holds a revered place in the hearts of generations of Americans. "Her husband, our 41st president, wrote in his last days in office: history will show that she was beloved because she was real and she cared and she gave of herself. Who could say it better?," he said. Is Trump the plumpest US President in recent times? What kind of First Lady will Melania Trump make?